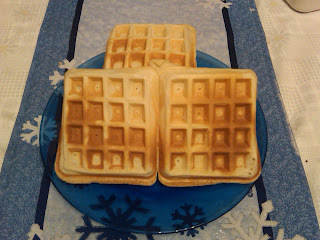 I Should Be In The Kitchen: Waffle Shortage, eek! Put dry ingredients into a bowl and set aside. Beat eggs. Add other wet ingredients and mix. Add wet ingredients to dry ingredients and mix until moistened. You don't want to over mix or they'll be rubbery. Follow instructions on your waffle iron to cook waffles. Pull out of iron using a fork. Set aside on a plate (with a paper towel underneath to absorb excess moisture) until they reach room temperature and then put them in the freezer. Pull out and pop in the toaster when you want to enjoy. Easy peasy!